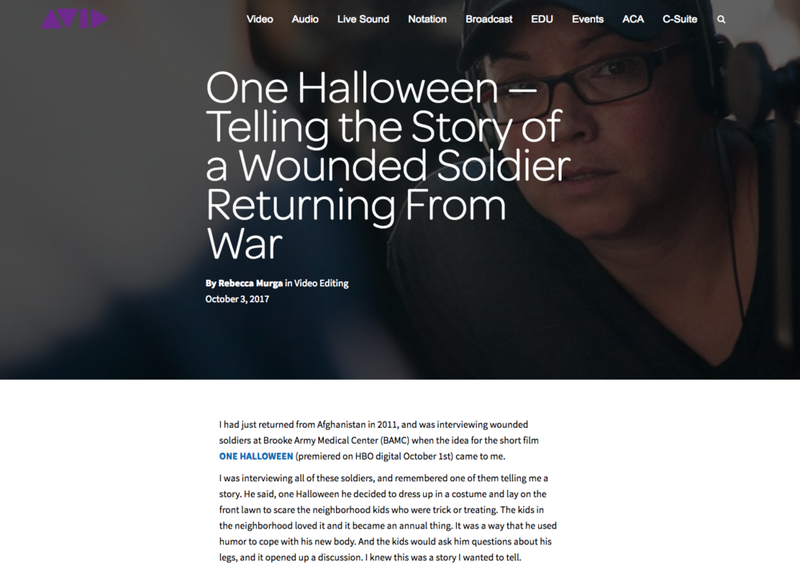 Rebecca Murga's articles on veterans and women's issues have been published in The New York Times, The Global Journal, The Morning Call, and San Jose Mercury News, to name a few. She has appeared on ABC's "Good Morning America," and "The View." Most recently, she was featured on NPR as the director of a short film “War Ink” which tells veteran's war stories through their tattoos. Her work has been featured on Mundo Fox, ABC, CBS, and her next short film will be featured on HBO Digital. Deadline: "Disney-ABC Directing Program Names 10 New Shadowers; Alumni Nab Footholds"
Fairfax County Times: "A woman soldier, is always a woman soldier"
DEADLINE HOLLYWOOD -- Indie film directors, television editors and a former Spike Lee Fellow are among the 10 program directors chosen by Disney-ABC Television Group to take part in its 2016-17 Directing Program. The participants will be pitched to shadow on such ABC series as Fresh Off the Boat, The Goldbergs, The Real O’Neals, Quantico and Scandal; Freeform’s Shadowhunters and Young & Hungry; and Disney Channel’s KC Undercover and Stuck in the Middle. MILITARY TIMES - JUNE 1, 2015 - For Army Reserve Capt. Rebecca Murga, telling the story of women in combat ranks in significance just below the privilege of actually donning a military uniform. Murga, a filmmaker, photographer and writer, is working on her latest short film, "American Girl," which follows a young woman's experience in becoming a soldier who eventually serves in Afghanistan. She's one of 10 applicants participating in the AFI Conservatory Directing Workshop for Women this year, giving her the experience and skills to make the short film, which she hopes to turn into a full-length feature in 2016. She is the first service member to participate in the yearlong course, started by the American Film Institute in 1974. Her film's basic subject matter is timely, as opportunities for women in the military are changing at an increasingly swift pace. War Ink is a documentary short film and digital art exhibit that combines original video, photography, and audio of combat veterans telling their stories through their tattoos. The NPR interview is part of KPCC's ongoing coverage of issues affecting veterans for Veterans Day 2014. In 2013, as part of ABC’s annual “Home for the Holidays” campaign and in support of Disney’s company-wide “Heroes Work Here” initiative, five military veterans with aspirations to work in the entertainment industry, were selected to write and direct short films, that were produced by Lussier, a full-service production company located in Burbank, California. The shorts were thematically centered around U.S. Veterans coming home for the holiday season. Interview with Rebecca Murga on ABC's "Good Morning America" for the launch of the network's Home for the Holidays Campaign. Murga was one of five veterans selected from hundreds of scripts for the ABC campaign. Interview with US Army Captain Rebecca Murga and US Army SSG Ryan Curtis on ABC's "The View," promoting the ABC "Home for the Holidays" Campaign. Rebecca Murga's ABC short film THE LETTER Honored For Best Online Film & VideoIn The 18th Annual Webby Awards. LOS ANGELES, CALIFORNIA— [May 2014] – Rebecca Murga's ABC short film THE LETTER announced today that it has been honored for Best Short Film Drama online film & video in the 18th Annual Webby Awards. Hailed as the “Internet’s highest honor” by The New York Times, The Webby Awards, presented by the International Academy of Digital Arts and Sciences (IADAS), is the leading international award honoring excellence on the Internet. IADAS, which nominates and selects The Webby Award Winners, is comprised of Web industry experts, including Tumblr founder, David Karp, Executive Creative Director at Refinery29, Piera Gelardi, Musicians Questlove & Grimes, Head of Fashion Partnerships at Instagram, Eva Chen, Twitter co-founder, Biz Stone, Jimmy Kimmel, and and creator of the .gif file format, Steve Wilhite. Rebecca Murga is an award-winning filmmaker who works in Los Angeles as a writer and director. She produces and directs short films, commercials, and digital series in both English and Spanish and her work has been featured on Mundo Fox, ABC, CBS, and AFN. Currently serving as a Captain and Public Affairs Officer in the US Army Reserve, Rebecca has deployed to Iraq, Kuwait, and Afghanistan. In 2015 she was selected for the AFI Conservatory Directing Workshop for Women. Out of hundreds of applicants, only 10 directors were accepted in the 2015 class. Participants from the program are required to complete a short film that will be screened at an annual showcase for agents, manager, producers, and executives at the Directors Guild Theater in LA in May, 2016. She completed her short film AMERICAN GIRL in 2016. Hailed as the “Internet’s highest honor” by The New York Times, The Webby Awards is the leading international award honoring excellence on the Internet, including Websites, Online Film & Video, Advertising & Media, Mobile Sites & Apps and Social. Established in 1996, The Webby Awards received nearly 13,000 entries from all 50 states and 70 countries worldwide this year. The Webby Awards is presented by the International Academy of Digital Arts and Sciences (IADAS). Sponsors and Partners of The Webby Awards include: Vitamin T, Shocase, Engine Yard, Code and Theory, Advertising Age and Google.